Why did the pumpkin roll into a bar? It fell off the wagon. Why was the jack-o-lantern scared to enter the bar? It had no guts. Why did the pumpkin walk into a bar and then divide its circumference by its diameter? It wanted pumpkin pi. These jokes are even worse than my strawberry walks into a bar jokes. And those were pretty bad. Plus, if any of you are like me, you're getting sick of pumpkin already. 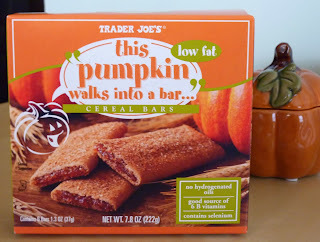 Thank goodness Russ's most recent review gave us a brief reprieve from What Pumpkin Products Are Good at Trader Joe's? But hey, this will be the last pumpkin review for a bit. Promise. Unless of course we see a really cool pumpkin product at TJ's that we've never had before. In that case, all bets are off. So let me just cut to the chase here. These are pretty typical cereal bars. I think they taste like pumpkin, Sonia does not. She thinks they smell like pumpkin, probably due to the presence of pumpkin spices, but says they could just as easily be fig or apple. I totally disagree. They're just as sweet as a figgish flavor, but again, we have cinnamon, nutmeg, ginger, and allspice present; unmistakably pumpkinesque spices. 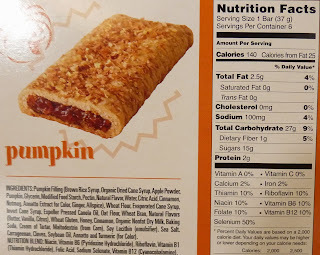 And unlike any other pumpkin product we've reviewed this season, the main ingredient of this product is actually "pumpkin filling," which in my opinion virtually guarantees a satisfactory pumpkinosity level. (Special thanks to reader stevenp for allowing me to steal the word "pumpkinosity.") 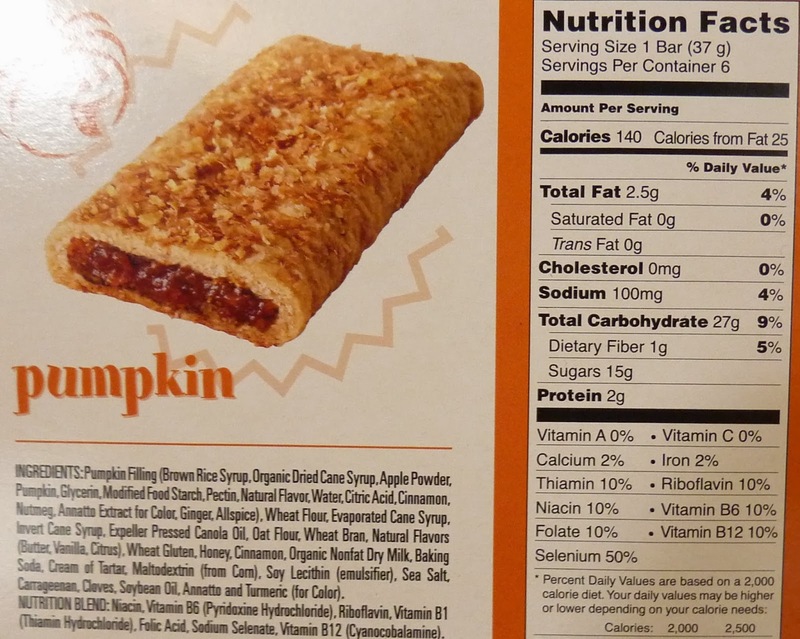 Granted, the main ingredient in the pumpkin filling isn't "pumpkin," but pumpkin isn't the main ingredient in anything. "Pumpkin" isn't even the main ingredient in a pumpkin! Water is. And that's your science lesson for the day, kids. For her perceived lack of pumpkin, Sonia only gives these 3 stars. But then, Sonia smells like a giant piece of pumpkin pie this time of year. No, she doesn't have pumpkin spice perfume. There's just enough pumpkin in her system that the excess is coming out of her pores. I can't give this a lower score than I gave to the other "walks into a bar" bars. It's still a moist, bready, snacky, yummy breakfast bar, and this one has a fun, seasonal theme. So 4 stars from me. I suffer from the same pumpkin addiction and agree that they don't taste very pumpkin-y. They taste more like the spices you eat with pumpkin. I grabbed these last week and I agree with your wife. They have a much more distinct spice taste than, say, a Nutragrain bar, but I was less than thrilled. It was the first time I had a cereal abr in years and reminded me why I much prefer granola bars. I guess I'm part of the minority that approves of this product. But thanks for sharing your thoughts, BK! No problem. I also purchased their Pumpkin Bagels and did not like them very much. They were quite dense and the pumpkin flavor was not as good as Einstein Bros fresh-baked pumpkin bagels. Hmmm...that's disappointing, but again, thanks for the info. I'll have to stop by an Einstein Bros next time I get the chance. You should check out the pumpkin pecan oatmeal. It's divine! Yeah, I guess the taste is kinda similar to sweet potato. I agree with Sonia. Speaking of pumpkin perfume, has Sonia tried the pumpkin body butter? It was tempting to purchase but would like to smell it first.